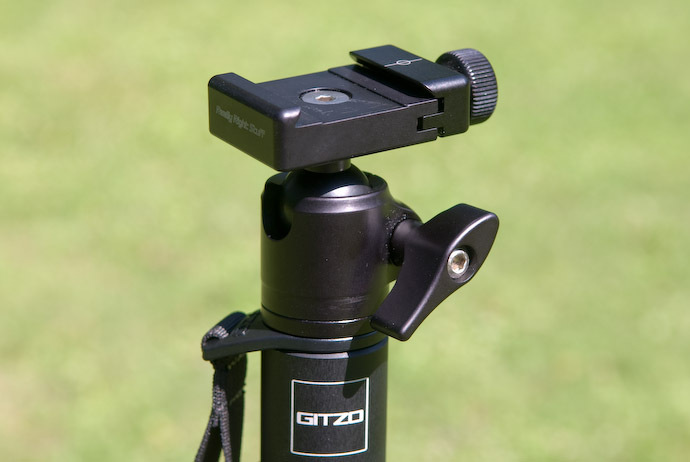 I recently wrote about the pro-caliber tripod I put together with components from Gitzo and Really Right Stuff. 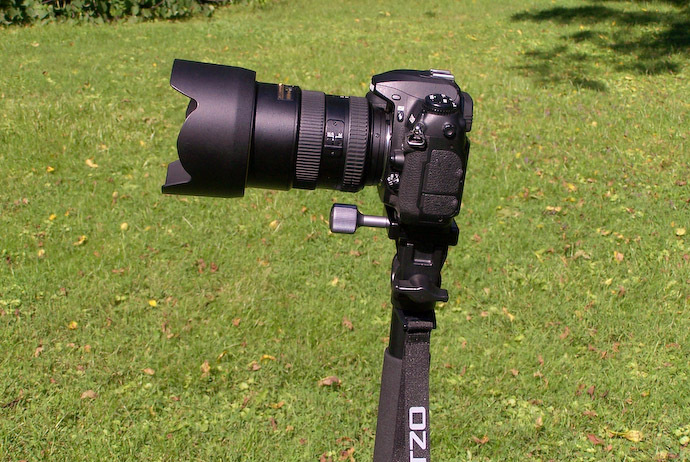 This time I'm writing about a monopod that I put together at the same time. However, unlike the tripod, it took two tries to get a good monopod solution, and at that, I'm still not 100% happy with it. Update: I made some changes, described in updates below, and now I'm happy with it. I had no problem with the monopod leg itself, a Gitzo GM3550 6X Carbon Fiber 5 Section G-Lock Monopod. It's got the G-Lock section logs that are so nice to use, and it's long enough to suit my 6'4” height. Really Right Stuff makes wonderful stuff, and as I wrote on my tripod posting, their flagship BH-55 ballhead is so finely crafted and so precisely made that one somehow feels a strange desire to lick it. It's not really possible to overemphasize the quality of and workmanship involved here. However, their mini BH-25 is not at all in the same class. I like to think that I'm not a total wimp, but I couldn't clamp it strongly enough to stop my D200 + 17-55/2.8 from moving around. It lacks the smooth feel of its big brother (more like big third cousin). I was disappointed. So, I called Really Right Stuff and asked if perhaps I was doing something wrong, to which they said “yes, the BH-25 is not really appropriate for a monopod.” They said that I should send the BH-25 back to them for a full refund, which I later did. Update: I got rid of the Manfrotto swivel described here... details further below. I ordered it while on the phone with them, and they offered to send it pre-assembled so that I'd not have to spend the 30 seconds to do it myself. I thought that was nice. I've used it a few times now, and still need more practice, but one thing I'm not happy about is that it requires a wrench when switching between a lens with a mounting foot and one without. A quick-release clamp on a camera is mounted at right angles to one mounted on the foot of a zoom lens, and since the Manfrotto swivel moves on only one axis, the clamp installed on top of it needs to be rotated 90° when switching lenses. That requires a wrench, and sort of defeats the whole purpose of quick-release clamps. One way to solve the problem is to mount the zoom's quick-release clamp sideways. This would be a perfect solution except that the plate is intended to be mounted lengthwise with two bolts, and could tend to allow rotation when mounted with just one bolt. It'd be a kludge, at best. Now, if Really Right Stuff (or anyone) produced a right-angle quick-release clamp for a zoom, the problem would be solved. Update: I ended up dumping the horrid Manfrotto swivel for a Really Right Stuff product that came out a few years later, their High-Capacity Monopod Head, a wonderful product that makes my monopod solution complete. 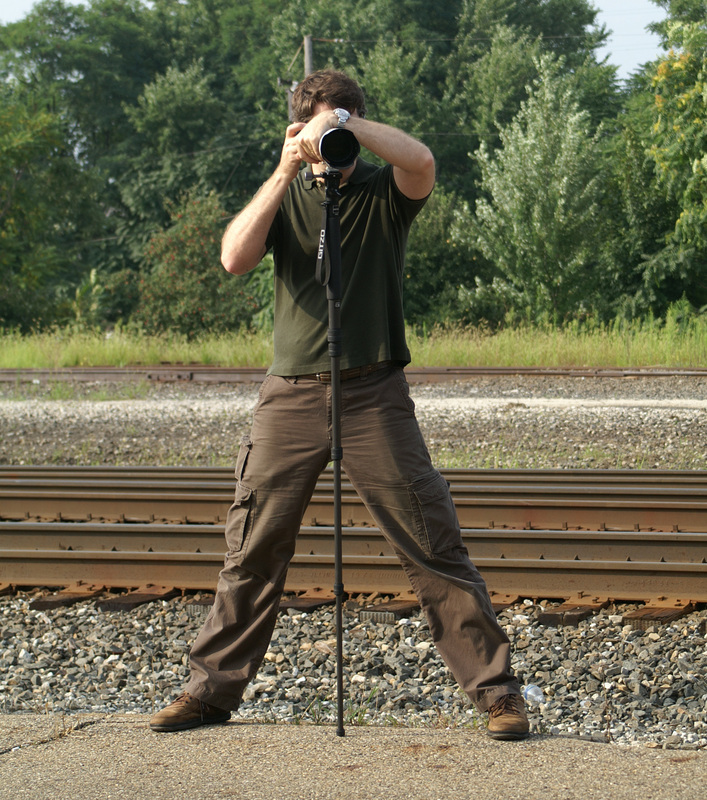 I need more practice with my monopod, and I need to read stuff like this guide to using a monopod. I used it somewhat clumsily when photographing the scruffy wet birds the other day, and quite a bit yesterday at the train station. Had I known she was taking pictures of me, I would have pretended to use a better stance. It's good that my feet aren't together, and good that I'm draping my free hand over the head of the long 70-200 f/2.8 zoom to dampen vibrations, but the tripod is straight up and down, which is not as good as having it angled out away from me like a third tripod leg. The problem was as described above: I didn't have the wrench with me, so I couldn't reset the clamp for the zoom lens, effectively disabling any sensible adjustability on the head. I could adjust only so far as I could tilt the thing, and that was it. 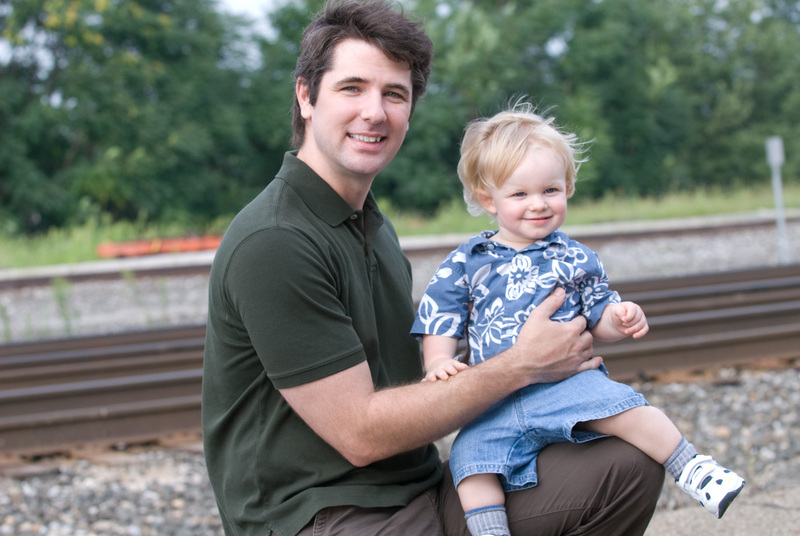 It was still a pleasure to work with, and I'm sure the results were much better than I would have gotten handheld. I'll probably adjust the clamp for use with the zoom, and generally forgo the monopod when using a shorter lens. We'll see. As for lenses with tripod feet, here is what I would do: Loosen the tripod ring and rotate the lens in the ring. I can confirm that this works well with the smaller Canon lenses such as the 300 f/4 IS. I have a bunch of the RRS pano stuff (the full spherical setup with two rotating clamps) and I love it. It is just so well done. You can adapt the pano stuff to be a poor man’s gimbal head. Rotating the collar is the only way to make that work. I’ve been looking at the RRS Monopod solution you mention for quite some time. I got a different impression than you did with regards to how the head should be mounted. 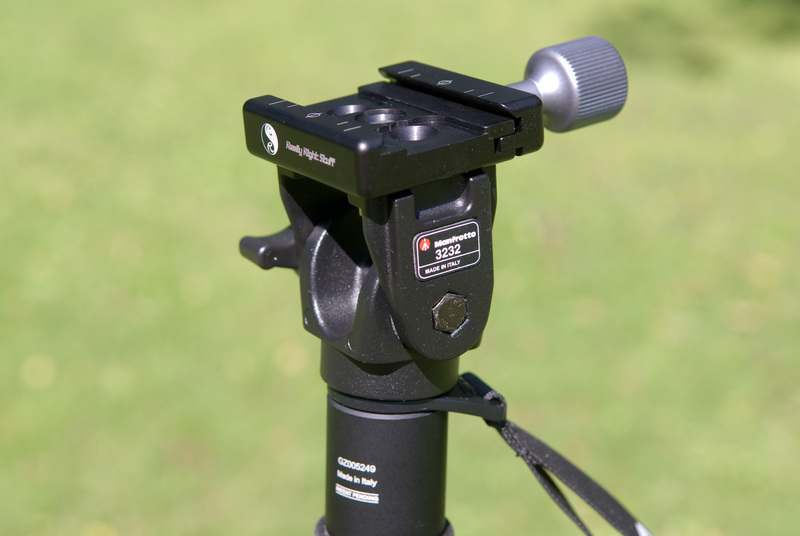 I thought the Manfrotto head should be mounted such that you can flip the camera from side to side — thereby allowing you to take horizontal and vertical shots with a lens without a tripod collar. 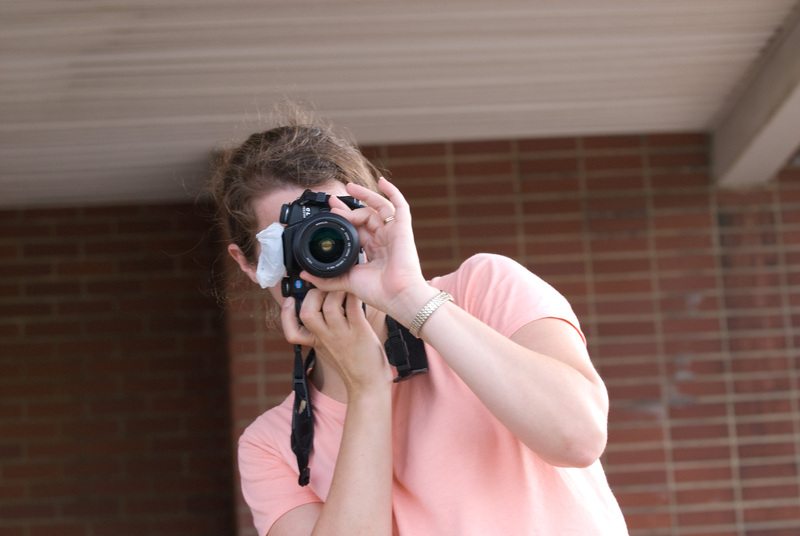 To do this with a lens with a tripod collar, you spin the lens in the collar. 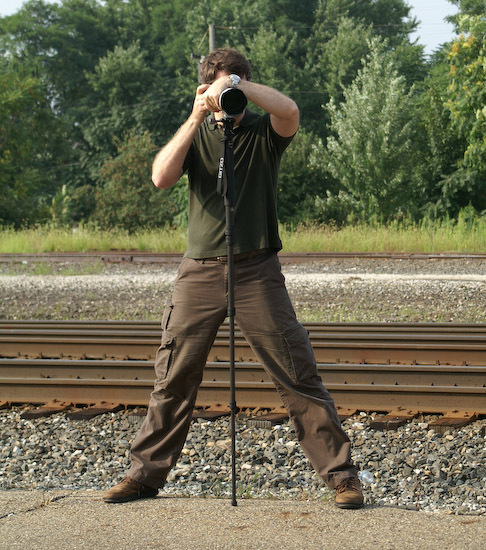 The whole idea with a monopod is to rock the monopod forward or backward to change the vertical angle of the camera. Putting the camera strap around your neck, you can then push the monopod / camera against the camera strap making a somewhat sturdier base and including your two legs in the equation creating almost a tripod. 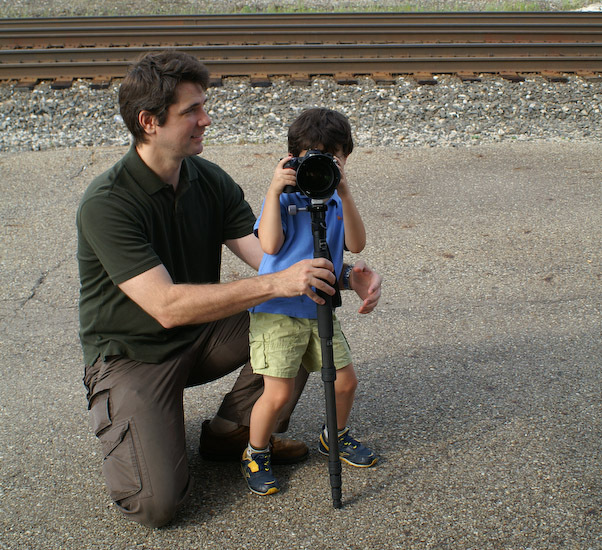 I use the Gitzo G1277M ballhead on my monopod with a Canon 30D and 70-200 2.8 IS, and I like it very much. I have no problem locking it tight and I like the flexibility it provides. Mark: IMO the manfrotto head should be used for tilting the camera up/down. Use an L plate to flip the camera. Like Jeffrey says, that would require a repositioning of the QR head when using a lens with a tripod collar. Simplest solution is to use a square QR plate on the lens. Allows mounting “both ways” so to speak. RRS makes them, so does Novoflex. Alternatively, Markins makes “Bi directional” camera plates which can be mounted both ways. Thanks for an interesting post, Jeffrey. I have the same ‘problem’ you have with the lens plates and camera plates being at 90 degree angles to each other. Did you ever find a good solution to that? Thanks for the info on the tilt head, very good stuff to know. An expensive option for dealing with the perpendicular plate mounting problem is to use a leveling or “panorama” base. I have never used one, but if it’s for making panoramas I imagine it should swivel 360 degrees. was the cheapest ($77 as of this posting) I could find with a few minutes of searching. Acratech makes one too but it’s double the price.